I recently finished what I would consider to be the best game of Stellaris I’ve yet played. 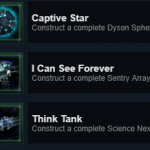 This post isn’t related to my ongoing Lavis Chronicles series, but in terms of raw accomplishments (and Steam achievements), it certainly provided the most “bang” from a gameplay perspective of any Stellaris game I’ve finished yet. My empire started directly next to a fallen empire, one of the super-powerful but non-hostile groups that may play a role in the very end-game. That means functionally nobody could come from my West, so I only had to defend my East (North and South were only accessible from hyperlanes in the East). Building up a very comfortable set of colonies, I realized there was a ruined megastructure within my space. Deciding I wanted to build great things, I pumped my research as high as it could go and started down the path to void engineering. The empire wasn’t strictly pacifist in nature, but it was focused on research and other intellectual pursuits rather than martial combat. I was running very high on mineral and energy credit income, and kept my fleet sufficient to ward off any hostiles. I didn’t meet most any of the other empires, who I would later learn were primarily on the other side of the fallen empire blockade, but that just gave me more room to expand, and more time to focus on inward pursuits rather than outward hostilities. I posted large defensive fortresses at the three entrances to my empire space, and decided to start terraforming worlds to make them more habitable. By the end of the game I had 16 core worlds, no sectors, and all were hustling and bustling with motivated, happy, pops. I managed to get the ruined ring habitat back up and running, and started building my own, new megastructures. 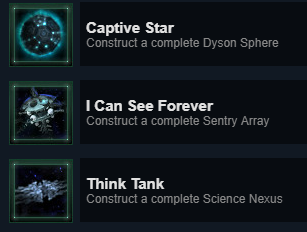 Due to the buffer between me and the rest of the empire, I was able to create and fully upgrade three buildings I hadn’t ever attempted before: the Dyson Sphere, Sensor Array, and Science Nexus. Talk about a boost to my research speed! After remaining relatively ignorant of the greater universe, even through 100 years or so, I decided to start building up my navy. After all, the other empires wouldn’t have been biding their time, so I need to make sure I could defend myself. With fleet power in the high 30k range, I sought glory among the stars. Almost immediately I ran into the Dreadnought, an automated ship filled with strange technology, and very hostile intentions. Subduing it, It added a nice 5k bump to my fleet power. Shortly thereafter I came across an abyssal horror, a horrific creature from another dimension. I hadn’t ever seen that creature spawn, let alone fight it, so after a conversation with a helpful NPC who gave me some tips (and a +25% damage boost), I charged in. It too fell beneath my onslaught of missiles and alien-inspired biologic flagella ships. Though by the time I encountered them I was highly overpowered, it was fantastic to see how the combat played out against these beasts. I had destroyed other Leviathan-class enemies in other playthroughs, but this was the first time I got to tangle with both of these. Great fights, would assault again. There are many different factors which can contribute to which endgame events spawn in a given Stellaris universe. Encouraging the development of psionic ability, creating self-aware robots, even pushing navy ships to the limits of their logistical ability. There are other crises, but in today’s play it was a machine uprising, of a sort. 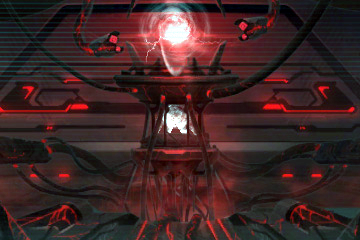 One of the other galactic empires had given rise to sentient AI, who then revolted against their masters. I took no part in their war, which was ultimately successful for the biological creators, but only a few decades later robots across the universe began acting strangely, and a low-frequency hum was heard on subspace transmissions. It seems an extra-galactic robot intelligence was making a bee-line course for our neck of creation. I’ve explored other end-game crises before (no spoilers for my Lavis Chronicles story!) 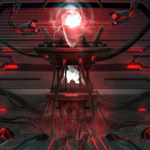 , but this was the first time I had synthetic beings from beyond the void come and try to shut down our peace and quiet. Their arrival caused the sleeping ancient empire next to me to wake up, which was horrifying in its own right. They may not have been focused on my immediate destruction, but their fleets easily eclipsed anything I could put on the field. Luckily the other empires were able to put aside their squabbles for the time being, and even started recognizing myself as an entity in the great war. I fit the largest battleships possible with the highest-technology devices I could muster, including the once-forbidden jump drives, and brought my forces to bear. After long decades of war, I finally had a bead on the machine homeworld, a single system defended by over 250k worth of navy power. Daunted but not defeated, I started marshaling my forces. I ended up with both the largest fleet capacity I’d ever managed as well as the largest fleet I had ever seen – 756 total cap, 1300 used. If it weren’t for a rock-solid industry and infrastructure system I had set up earlier, as well as the benefits of those megastructures, I would never have been able to launch so many ships. I threw nearly 300,000 fleet power at the enemy homeworld, and after a very long back-and-forth, I came out on top. The artificial fleet was vanquished, its threat wiped out from the universe. Its demise ensured that there would be no other end-game crises, so all of that forbidden technology was now free to be researched, something I definitely enjoyed taking advantage of. The fallen empire, its job finished (though honestly it really didn’t contribute anything to the vast war, always showing up after the fleet engagements were over), left the galaxy, leaving a whole host of megastructures right on my porch. What an incredibly satisfying way to end a game – the struggle was real, the question always in doubt, and in the end, victory was rewarded. While I absolutely understand why this game isn’t for everyone, and I myself have played a large number of games which barely got off the ground before ending horribly, it’s long games like this one that really give Stellaris the opportunity to shine. My scientists were detecting anomalies I had never studied before, political machinations were in play between secret factions, and (perhaps) for the first time I really got to see the whole of the universe band together against a common threat. All very, very cool stuff, and a really fun experience.